Hobart Johnstone and Gigi Whitley are considered the patriarchs who presided over the creation of Hollywood. Their city has forever changed the course of history, portraying visions of glamour and romance to a degree unmatched anywhere else. Nestled in hills covered in towering eucalyptus and orange groves, Hollywood was built as part of a grand scheme by visionary developer HJ Whitley, “ The Father of Hollywood.” Why did the Los Angeles Times and others in the community give him this title? Whitley Heights was the Beverly Hills of yesteryear, and some of the most impressive homes in Hollywood are located there. Stars like Jean Harlow, Ethel Barrymore, Charlie Chaplin, Marion Davies, W.C. Fields, Harold Lloyd, Carole Lombard, Rudolph Valentino, and many others lived and held legendary parties in the Heights. How did he get them to settle there? What was the magical draw this amazing man possessed? Learn the true story of how Hollywood got its name. From the earliest silent films made by pioneering American filmmakers to the multimillion-dollar blockbusters of today, the movie industry of America has always had a home: Hollywood. But how did Hollywood itself get started? Who were the driving forces behind its creation and development – the visionaries and kingmakers who built the infrastructure of a worldwide industry but only received a fraction of the credit that was heaped upon the stars of the silver screen? Movie buffs nowadays have no idea that so much of what we take for granted about Hollywood was largely planned, designed, and built by Hobart Johnstone Whitley, an extraordinary individual who is not nearly as well known as he should be. “HJ” was the primary developer of Hollywood, a central figure in attracting and keeping the talent needed to make such an ambitious project successful and, in turn, transform a formerly sleepy part of California into a hugely profitable and exciting industry. 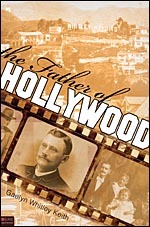 Gaelyn Whitley Keith’s remarkable book, The Father of Hollywood: The True Story, goes a long way toward erasing the misconceptions concerning HJ’s life and career, and paints a truly charming portrait of the man who lived a life that itself is worthy of a fine movie.